To date we have run many courses over the past ten years across the whole of the Highlands and Islands of Scotland; as well as bespoke courses in North Wales, The Peak District, New Forest, Epping Forrest, Dorset and Cornwall. Above is the 28 minute film produced by Anthony, JJ & Thao from the footage filmed during their Diploma in Wildlife Documentary Film–making course. The whole film was filmed and produced on location on the Isle of Mull during the 8 week practical section of this 16 week course. Thao held experience in film, but non of them had produced a wildlife film before. How do you think your course went ? I think the course went well. I have come here and learnt a whole new handset of skills, which I would not have acquired anywhere else in the same amount of time. During the duration of the course we have been able to make a 30 min film. Developed the basic essential skills for editing footage and audio. I have become more affluent with the language and ethical behavior required for the film industry. I came on the course to develop my out-door skills to be able to carry out a similar scenario on my own . Did you enjoy your course / What was your favourite moment? I really enjoyed the course and was excited for the experience from day one. Spending time around camp with the course peers has been a delightful experience and have formed strong friendships with all members. Coming to Mull was a unique experience for me as I have never seen any of the UK’s iconic wildlife. There were plenty breath taking moments. Down at knock farm we had two buzzard fly by a dozen feet in front of us. My favourite moment however has to be when we went out on Martin’s boat. I managed to film a close up of the fish eagle fishing which wasn’t too shabby If I do say so myself. This was an extremely proud moment for my and gave me a sense of fulfillment with the course. What did you like about your instructor ? Ric is a charismatic instructor which thoroughly knows his craft. There was a good balance of work and leisure on the course which enabled us to get everything done. I appreciated his firm personality if we made any mistakes, as if this was not the case we would have most likely repeated them. This is a very good quality to ensure everything goes smoothly especially when dealing with really expensive equipment. 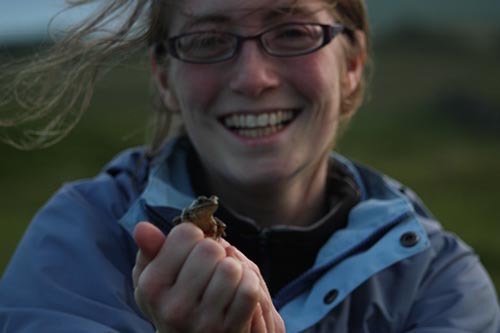 My experience at the UK wildlife film school has been one of learning and fun. The course went well and started of on a slow note as we familiarised ourselves with the equipment we were going to use, and the code of conduct required in the industry. Through out my time here I have gained a handset of skills, from the set up of a tripod and mounting the camera, to the workings of Adobe premiere pro and how to piece a film together. I wouldn’t have been able to learn all of this in the same amount of time anywhere else. By the end of the course we managed to produce a 30 minute film which was not only informative but entertaining with our own special touch. If you come on this course by the time you leave you will be proficient in all the processes that go into making a wildlife film from pre-production all the way to post production. Coming on the course also gave me the opportunity to witness a whole new side of the natural world that I have never seen before. Being in a different environment such as Mull you will encounter some of the UK’s most iconic wildlife. I have had an amazing lifetime experience on Mull and acquired knowledge skills and friendships that will serve me a lifetime. I feel the course went really well. 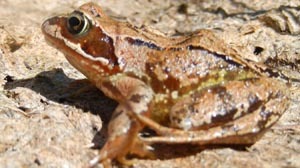 I learn so much I had no idea about not only about wildlife filming but also field craft and the wider film industry. We completed the film and made it to a good standard considering none of us had picked up a video camera or used a proper editing system before. I would say so yes, I set out with few expectations. But the main one was to learn how to make a quality documentary. Although I did not expect us to make us a broadcast standard film. I expected us to make something decent and I believe we exceeded that and produced something you would like to watch; and watch all the way through. I definitely learnt all the things I wished to learn on the course regarding camera, audio and editing equipment. Learnt their function, use and care. I feel like I have a good grounding all those things so that I can have a career in this field. I did enjoy the course, my favourite part of the course was going out on the boat and filming the sea eagles, it was a really cool experience and considering that we had pretty much a month and a half of miserable weather to get a nice day to film the eagles was special. I also really enjoyed the editing process it was where you could see how a film is really made. The layers of audio and video lines that build up a film so that it works as one piece. It also gave me a better understanding of how to use camera as you can point and shoot at anything but what you film and how you film it needs to be filmed through the eyes of the editor or viewer. You may really like it but it may be useless for the edit and won’t engage the viewer. Ric is a firm and fair instructor, he has a wealth of knowledge and he takes time to speak to locals that you gain valuable knowledge from that otherwise would go a miss. He is always trying to improve you as his student and will tell you exactly how it is. When you do well you’ll get praise but at the same time you’ll get told when it’s wrong. Camp craft and organisation is paramount and your skills will improve with Ric and he always has stories to tell..
Before this course I was unsure of how or what it entails to work in wildlife film. All I knew is that I had a passion for wildlife and working in an admin wasn’t for me. Arriving in Oban two days after my last day at work I was nervous but excited. The course is what you make of it, the more you put in the more you get out. Listening and watching Ric and your peers you can learn a lot. It seems with wildlife film the best way to learn is by learning from mistakes. Before you make them or someone else does you have no idea how important the little things are (even when Ric tells you). From using camera, pitching tents and editing, there is nothing I didn’t improve in. Becoming comfortable with the camera gear, ranging from a dji osmo to the fs7 a production level camera was a steep learning curve. Although I have watched a plethora of wildlife documentaries and have some knowledge about wildlife. You really come to understand the skills needed to produce a wildlife film. Filming to a script is easier said than done with wildlife, initially I wanted to do my segment on Birds of Prey, but unfortunately apart from Buzzards they seemed to be more elusive than they normally are this year. But the most engaging part was the edit process. When the film comes together. Where you choose and add music and end up with your final film. Our film really shows the fun we had on this course, we weren’t always the most productive with our days. But using creativity we managed to use our footage to its fullest. Life changing experience, I’ll be back to Mull to see white Tailed Sea Eagles, Otters and hopefully a Golden Eagle that isn’t so far away I need 3000mm lens. It’s a shock to the system as wildlife filmmaking isn’t as romantic as it’s made out to be but it’s thoroughly rewarding, and that final film makes it all worth it. If I am lucky enough to work in wildlife film in the future this will be a perfect grounding. Above is the film Patrick and Mads produced from the footage filmed during their 12 day wildlife film course on the Isle of Mull in July 2017. I have very little to compare it to as previous film courses have been less specialised and different in terms of kit etc. I think the end results were good and I gained some good experience. I believe my overall performance improved somewhat and reviled areas I need to focus on. Some very good shots and overall editing sessions. Feel I need more time and attention to camp craft and outdoorsmanship. Some tough times, but all are usable for future learning and improvement. Leaving with a complete film and gaining experience were very much my goals. So I can now say I have been successful with these. Yes. I enjoyed a number of things about the course, particularly the practice more specialised kit than I am previously used to. I also enjoyed the experience of spotting and the team element involved - even when you’re not on camera. Filming the three Red Deer moving though the field in the evening were a highlight..
Ric is very knowledgeable about the wildlife, the island, its laws & customs, the technology and efficient camp craft. He was also very receptive to ideas during the writing / editing and planning stages and had a good sense for when to lead or steer with the scheduled planning, and when not too. He was also relatively hands-off during the edit stages allowing us to take creative decisions and make our own discoveries. Survived for 12 days, learned some useful things for wildlife but which may also be transferable to other filming projects. I am leaving with a strong sense of what to film with in the future. Film looks good. I made a good friend in Mads. Partly happy to be leaving as soon off to see family and will enjoy returning to regular life though I felt comfortable enough in the tent. Despite some difficulties I am not discouraged but now have a greater perspective of challenges facing operators in the field. I would say my filming has improved as there are some really good shots that display smooth movements that required quick decision making – when following the Red Deer for instance, whether to keep all three in frame or back off and just follow one or two. I feel like this sort of thing, which comes with practice, is an essential part of good film making technique and attitude. Likewise, previous editing experience has paid off in terms of some problem solving and quick work arounds. Good. The number of days fitted well into my schedule. I put my heart into it and think that it paid off. Yes, I wanted to get a feel of what wildlife film making was like as a first priority and I feel I have a good idea as to what this is now. Even better – I really like it. Also as an added bonus I now have a product (Film) that I can show others University etc.) as well as a lot of improvement in my filming and editing skills. Yes. It was a good educational time. Filing is most defiantly my most favorite part - more specifically following birds flying with a good smooth pan is challenging and very fun. I also enjoy the thrill and excitement when you when you do a good shot or the animal you've been waiting for suddenly appears. You really seem to know your stuff - kit, animals, techniques etc. You are also good at striking up a conversation which is a good skill when you are dealing with groups of strangers. I set out to learn more about what wildlife film making was - and now I have a more thorough understanding of what that implies. Along the way I also picked up a lot of new camera skills, editing skills and some general camp craft skills. The film Patrick and I produced seemed rather good and might be useful in the future (for instance when applying for college). I now feel more confident than ever that wildlife filming is something I want to pursue. Above is the film Daisy and Lukas produced from the footage filmed during their 12 week wildlife film course. During their course we visited the Loch Lomond and the Trossachs National Park, Avimore, Inverness, Loch Ness, The Isle of Mull, The Cairngorms and the Shetland Isles, during the editing process they decided to write a script that focused on the Shetland Islands, with footage they filmed from other parts of Scotland included to demonstrate the differences in the environments of the Shetland Islands and the rest of Scotland. At the end of the film there is also a short collection of footage of sequences they really liked and wanted to show, but didn´t find space in their final film to included them. Please enjoy the film... Thank you. Yes. I got a good feel of the logistics of a wildlife film production and what it takes to make one work. Having been on a previous course (Jura 12 days 2015) I challenge to challenge myself and take on the much longer 3 month course. Having much more time to adapt to the cameras and equipment I´ve been able to get a better grasp of how they function to the point of being able to comment on how they could be improved. I have had a more hours using the equipment than I can count and I can safely say I know their in´s and out´s. This course could be summed up as a wildlife filming tour of Scotland with the added bonus of learning about production. A long course has tested my limits with working as part of a group, but if you have a passion for filming wildlife as I do, this is definitely an experience to be had. Yes, I did. I know how to map read and I have gained a better understanding as to how the camera operates in terms of how the Iris effects the amount of light coming into the camera. My favorite moment was when we were on a boat trip to Noss and we managed to film Killer Whales which were only 8ft from the boat. Knowing that wildlife filming was something I was interested in and possibly pursue it as a career, I had no idea of how to go about it or the knowledge or skills required to get into it. I decided to go on this 3 month course rather than going to university hoping I would get an actual feel of what wildlife film makers go through, going away for a long amount of time. It has been challenging, and frustrating when you don't get certain shots you would have liked, but coming to the course with no experience as to how a film camera operates, the course has helped me to understand this. Not only have I learnt how to operate a film camera but what it is like to edit a film, and that it is very time consuming but worth it in the end. I feel that I have come away with enough experience and evidence of work to prove this. Above is the short film that Henry and Lukas produced during our last course on the Isle of Jura. Thank you. We would like to point out that neither of them had any experience of operating a camera before attending this course. Please enjoy the film... Thank you. How do you feel your course went? Fantastically: I had a brilliant time. Longest I’ve wild camped in one place; the whole experience was extremely rounded. Yes I did: I especially enjoyed learning the theory of learning how to work the camera (Iris settings and Depth of field etc.) Learning the details of editing was fascinating too. What aspects of the course would you change / add / remove / improve on? Honestly, I’d do a longer course where we camped for longer around a potentially lucrative location. I came to this course with downwards of zero experience actually operating a camera. I know this was a career I fancied getting into, but not any idea of how to or what kind of stuff might be required of me. Everything about the course was an experience that helped me further my knowledge and drive to learn all I could. I feel that I came away from it with enough experience for people to take my plans and ideas seriously, and that I have the skillset to back these claims up. Would happily recommend to a friend. I learned more than I expected. Having never used a camera before, I feel confident enough to pick up a camera and maybe even do some independent productions. I thoroughly enjoyed my time on the course. I can’t say I had a favorite The views were spectacular and being so close to the wildlife was always a thrill. Funnily enough, seeing a big stag shrug his head below his shoulders and almost crawl off the road from inside the car on one of the night drives, is close to the favorite if I had to decide, it showed an almost human side of the deer that I probably would never have seen in a documentary. The course itself is as good as it gets. But if it was lengthened, by maybe 2 weeks (and maybe filming from a boat) that would be a good experience. I came on the course with no knowledge of how to work a camera, let alone a film camera. Within a day, out in the field, I had learnt the basics and had already begun to try more advanced shots, Panning + Zooming etc. This course was nothing like learning in a classroom and was tailored to include and exceed the expectations we had set at the beginning. You get a good gauge of what it takes to be a wildlife cameraman in terms of editing, filming and carrying the equipment over distances. Along with the coursework, I have also been exposed to breath-taking scenery and the most star filled sky I have ever seen. If you aren’t afraid to get mud on your boots and want a taste of what it takes to make a wildlife documentary, I would defiantly recommend coming on this course. Above is the short film that Richard and Claire made during their 12 day wildlife film course on the Isle of Mull. I have really enjoyed my experience here on Mull. I have learnt a great deal from my Instructors & I feel I have progressed in my editing skills in particular. It has been great to find out what it is like to be a wildlife film-maker & try out all the aspects of the process of making a finished film. The course has confirmed to me that wildlife film making is certainly something I wish to pursue in the future. It has been a privilege to spend time on this beautiful island & get close to such wonderful wildlife. I am sad to be leaving ! I had a great time and enjoyed producing a short film. I particularly enjoyed going through all the steps on location, giving a sense of what would be required being a professional wildlife film maker. The locations and the scenery were also excellent, making it a great trip even ignoring the filming part, and it didn’t rain very much considering being in Scotland. I was really itching to come on a practical wildlife film course after attending a few courses at wildeye. I can confidently say, the UK Wildlife Film School has given me the core foundation knowledge of what is required when taking up the task of filming out on location, and what is required of you to complete a wildlife film production smoothly and successfully. I learned first hand the conflict of needing to film the Otter and wanting to watch him with my own eyes and not just through the eyepiece! 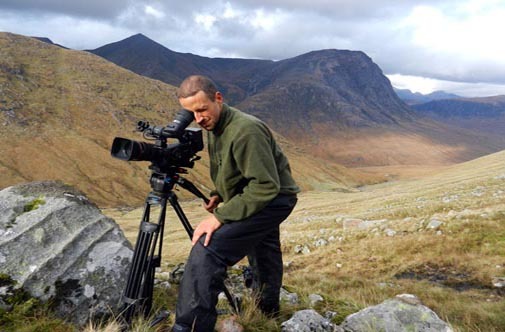 "This is the best way to learn wildlife film-making Scotland offers some incredible landscapes and to track the wildlife and film them directly in their environment is the core of this course. In some cases it may take some time but it's really worth effort. I have really enjoyed my experience here on Mull. I learned a great deal from my instructors and I feel I have progressed in my editing skills in particular. It has been great to find out what it is like to be a wildlife film maker and try out all the aspects of the process of making a finished film out on location. The course has confirmed for me that wildlife film making is something I wish to pursue in the future. It has been a privilege to spend time on this beautiful island and get so close to such wonderful wildlife. I am sad to be leaving! "The course was fantastic and the locations were even better. I actually filmed an otter within 1 hour of arriving on location! The whole week was truly inspirational." How do you think your course went? "The course was good. It was good to get experience like this out in the field." "I feel the course went well. 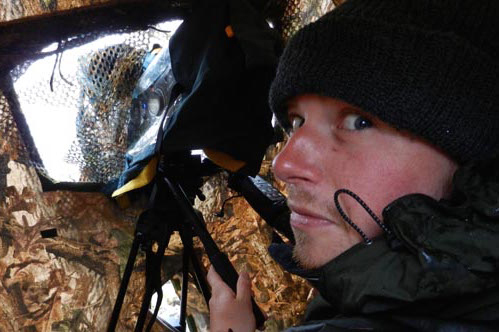 I liked the fact that despite all the student's preconceptions of what the course might be like, the course showed a very realistic example of what being a wildlife filmmaker is all about." "In the beginning we had a lot of carrying of equipment and group logistics to do that I hadn't thought about, but we accomplished everything very well in our days of filming and editing." What did you think about your instructors? 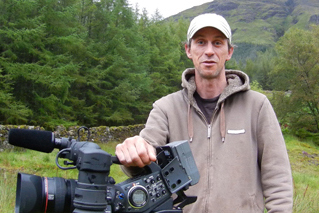 "Ric is clearly very knowledgeable and experienced in filming and surviving in the outdoors. He is interesting to talk to and prioritise safety above everything else. "Ric is a really interesting person with lots of life stories to tell. He knows his profession inside and out so it's been great learning from him over the past 12 days." "I felt safe to be in a remote location as Ric has a lot of experience in being outdoors, as well as information about the wildlife, the filming industry and equipment. Also, at the beginning of the course I misunderestimated the amount of equipment you need to live and work in a remote location, and this course has helped me understand this. "Filming the otter - and being close enough to be able to hear it eating!"